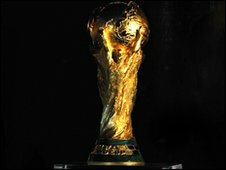 The Fifa World Cup trophy will visit Lincoln in its only stop-off at a UK football ground on a global tour. The trophy will arrive by helicopter at the Sincil Bank ground on 12 March and fans will have a chance to see it paraded before the Hereford Utd match. The trophy is on a 225-day, 86,300-mile tour taking in 83 countries on its way to the 2010 World Cup in South Africa. Lincoln City officials said it will be a "once in a lifetime opportunity" and a "truly memorable evening". Before arriving in Lincoln, the trophy will be displayed in London, and after the match it will be flown out of the UK.